Dragon captured: SpaceX’s first ISS supply mission is a success « Adafruit Industries – Makers, hackers, artists, designers and engineers! 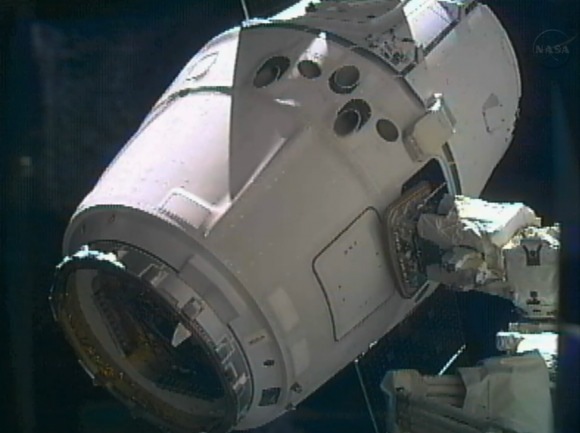 Dragon captured: SpaceX’s first ISS supply mission is a success. The SpaceX Dragon capsule has been successfully grabbed by the International Space Station, marking the first time a private American space flight has run a supply mission to the orbiting platform. The crew of the ISS snatched Dragon out of orbit ahead of schedule, using the space station’s robotic arm to guide the capsule in after its careful approach. I could have sworn this was the second Dragon to ISS supply mission.